Clinic students Daisy Ocampo (at left) and Jessica Garland (far right) talk with a client seeking to get her children back after they were kidnapped by her abusive husband, who fled to Mexico with them. Students gain experience in multiple areas of the law and develop multi-dimensional lawyering skills while evaluating the benefits and limits of various interventions in the complex problem of domestic violence. Students primarily represent low-income abuse survivors in restraining order and family law trials and immigration matters. Because the Clinic strives to provide holistic services, students also represent clients in public benefits, housing and criminal cases and collaborate with community partners to address clients’ safety and support needs. 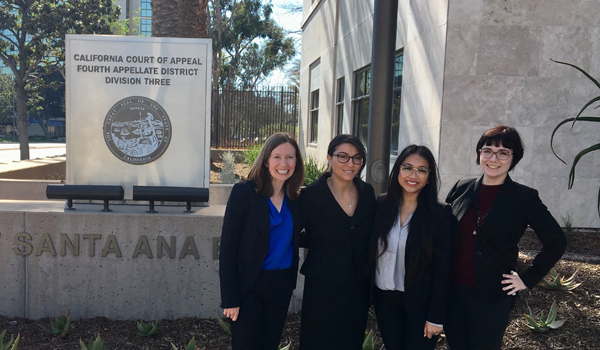 Students in the Domestic Violence Clinic learn to be client-centered, culturally sensitive and reflective advocates while they hone their trial and lawyering skills and help clients achieve freedom from violence. To produce broader systemic change, students also engage in community education or policy advocacy projects. In April 2017, the clinic, with co-counsel Mayer Brown, LLP and the Family Violence Law Project, filed an amicus brief in a significant California Supreme Court case involving domestic violence, juvenile immigration status, and child custody. In re Bianka M. involves a minor seeking Special Immigrant Juvenile (SIJ) status, a federal immigration status created by Congress to provide protection to undocumented, unaccompanied children who enter the United States after experiencing parental abuse, neglect, or abandonment. Bianka, an unaccompanied minor, came from Honduras to the United States at age 13. She reported that her father physically abused her mother while she was pregnant with Bianka, including beating her mother with a machete. He abandoned the family before Bianka was born. Bianka requested that her mother be granted sole custody of her in California and that the court certify her SIJ status. The lower court denied her requests, finding that because Bianka’s purported father was in Honduras, Bianka or her mother would have to solicit cooperation from him for the California court to exercise jurisdiction. The amicus brief discusses how this decision, if allowed to stand, would broadly impact the ability of abused, neglected, and abandoned children to obtain SIJ status findings necessary to escape abuse. The lower court’s ruling places abused children, children of abused parents, and survivors of abuse in the dangerous position of having to bargain with the abusive parent in order to be protected from that parent. The brief points out the lower court decision contradicts fundamental principles of California family and domestic violence laws, which prioritize the child’s interests and require courts to lessen (rather than enhance) an abuser’s power over a survivor of domestic violence. Oral argument is expected to occur in fall 2017.